Calcium imaging is a powerful approach that enables simultaneous recording of dozens or hundreds of neurons. Fluorescent calcium indicators are expressed either pan-neurally or in specific cell types, and fluorescence is measured using in vivo microscopy. Image: Neural activity recorded from hindbrain of zebrafish larva. We use behavioral assays to understand how animals sense and interact with their environment. When combined with cell manipulations, these assays also provide an important tool for dissecting the architecture of neural circuits. Image: 3D trajectory of freely-swimming zebrafish larva. Our lab employs computational models to examine the emergent properties of complex systems. Dynamic system models are used to understand how signal processing performed in different neuron types affects the function of neural circuits. Similarly, biomechanics and computational fluid dynamics models are used to examine the consequences of changes in behavior or morphology. 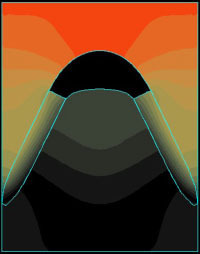 Image: Presure field around fish gills calculated using a computational fluid dynamics model.